I find Pentax SMC FA 28-105 f/3.2-4.5 the best walk-around lens in my gear. It is very lightweight, small and compact in size and the zoom range fits my needs really well. I have used this lens with Pentax K100D and Pentax pz-1 auto focus film body and lens performs well in both bodies. Compared to Tamron 28-75 f/2.8, it is not as sharp in wide open aperture but the color, lightweight and compactness of this lens has stood out among all the zoom lens that I have. And its bokeh is nice with rounded ring lights and it has rich color though not as sharp compared to Tamron 28-75 f/2.8 or my prime lens in 24mm, 28mm and 50mm. This capable zoom complements my Tokina 19-35 f/3.5-4.5 in traveling very well in the range from 19 to 105 with two zoom lens. And I can have one lens for all quick snapshots with this lens. For most of my shooting, I carry one prime and one zoom. And my latest is to carry this SMC FA 28-105 f/3.2-4.5 and either my manual primes with Spiratone 20mm f/2.8 or my Vivitar 24mm f/2.8. Lens is extremely lightweight and compact in size. 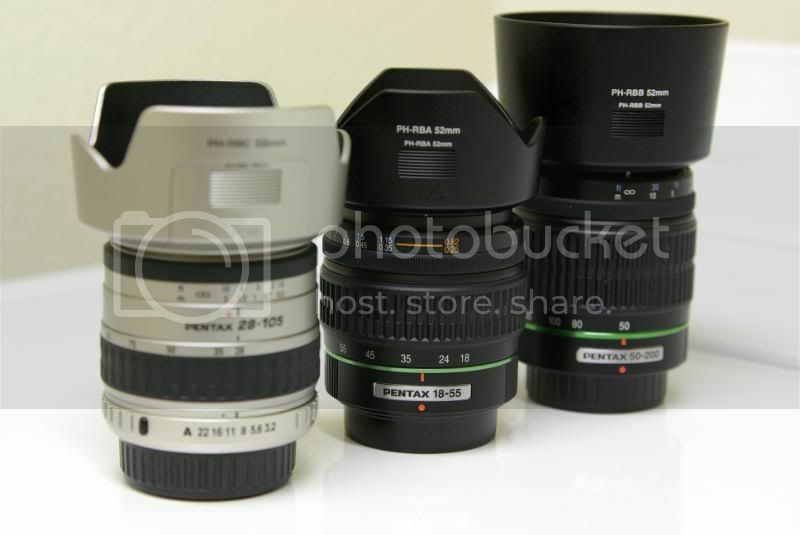 It is really not much bigger than the kit's lens in Pentax DA 18-55 f/3.5-5.6 and it is smaller than Pentax DA 50-200 f/4.0-5.6. A bit soft wide open in both wide and long ends. I see better results by f/5.6. Hi Hin, Great shots. The 28-105 is a great walk around lens and one that I carry with me at all times. Great blog, keep up the good work. I was thinking about trying to acquire this lens. However I'am wondering does the cropfactor come into play, so will it become a 28*1.5=42 mm to 105*1,5=150mm lens? Thanks for visits. The crop factor will apply to all lens when you have the dSLR such as the Pentax K100D/K10D. With the crop factor, you get the minus with not so wide in the range but you also get the longer reach to 150 in 35mm terms. I still prefer this focal range of 28-105 over the kit's lens for 18-55 as I find less need for lens change. I recently picked up a Power Zoom version of this lens. Great optics for a zoom, & I also prefer the focal range on a DSLR for outside work. Indoors I'm more inclined to use the 17-70mm Sigma. The build quality on the FA 28-105mm Power Zoom is VERY good. Hefty lens and solidly built. No wiggle room on this beastie even at full extension and the PZ switch seems solidly affixed. The PZ version has a rotating front element, and it is my understanding the version you have is internal focus, so no rotating filter. May I ask why have you parted with this lens? This is a very good lens. I have too many overlapping lens when I parted with this lens. I rate it the best for walk around purpose and it is very small and light for traveling. This lens is especially versatile in its focal range, even better when it is used with a film camera. A bit late to the party (May 2010), but thought I would get your opinion: Seems I can pick this lens up for approx 90 USD. That seems like a bargain in my ears. Agreed? For $90, that is a nice bargain price to have. I hope the lens is in good condition.